Sounds way better than the remastered cd version. Whatever source is used for this, I can recommend it. For the first time ever since the movie in 1961 the soundtrack is been released on vinyl which includes Moon River performed by Audrey Hepburn it might not seem like much but when this album first came out in the 60s in the single full-length album they all had her picture on it but none of them had the song. The important thing to look for is the waxtime logo in the top right it's the only one that has the song. Bummed that the bonus Audrey version of Moon River was taken from the film audio, rather than the original master tapes, but after searching high and low it's a delight to find it on record at all. By the way: if you want the version of Moon River Hepburn sings in the film? It's not on here, only on the original OST from the 60's. For whatever reason, it's been redacted from this. 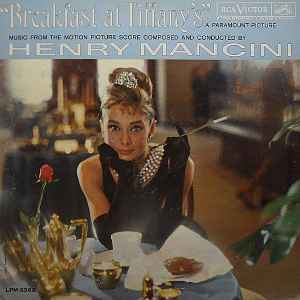 The supposed "promotional release" pictured above is actually just one album in a five album set of Henry Mancini records. I found the set today at a Salvation Army thrift shop. I looked at all the pitures at the link on this page ant it is identical to what I have. It is only housed in an inner sleeve because it is missing it's home with the heavy duty orange glossy box with the four other cuddly albums, and what a set it is! The label number on the box is PRS-159. On each individual inner sleeve they are numbered PRS-159-1, PRS-159-2, PRS-159-3, and so on for each album in the set. They are also numbered 1-5 on the top left corner of each album, this one your looking at is obviously number 2. Don't get ripped off--what is pictured above is not a "promo".